The morning was still dark and cold also felt chills when tourists out of Bergen Station and treading a rocky path towards the large pedestrian street located in front of the station. Marken morning it looks very quiet. If not many other tourists who pass through that road after getting off the train, you definitely do not dare to go through alone. The ranks of the old wooden houses in Marken decorated restaurant or clothes store name sign, some promotional banners also adorn the doors and windows. Morning wind began to blow again, you need to put your hand into the pocket of a jacket that can be relied upon to dispel cold, your head might be buzzing because of the cold, but still sober enough to admire the beauty of this place. on the road all not more than 500 meters, you will see the structure of the old city Bergen, with wooden houses, cobbled streets, the typical building style of old Bergen, and up and down the street. 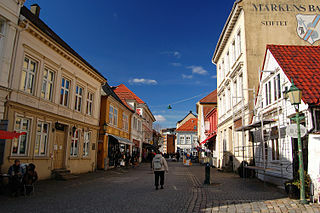 After passing Marken and around to some other places in the centrum round, you can easily conclude that all the buildings in town are similar all, from the style of the building using wood materials, large windows that covered the walls, until the color of the building is dominated by pastel colors, but not too much glare. It’s just the atmosphere that is present in Marken can not be beaten by anywhere else in Norway, Just Marken travelers are able to steal so comfortable to travel to Bergen. Marken was quiet and peaceful, but also buzzes with chatter exciting visitors who sit and enjoy their coffee. View of the old town is so thick as travelers take away a moment from life. In Marken clockwise as slower moving. Dynamics of life reduce speed every second. As coffee shops and restaurants invite passersby to break away from their fatigue and relax for a while. Promotion board that offers a daily menu lists prices ranging also issued as an open invitation to anyone who passed by. Travelers may not be the power to say no to lunch at one of the Indian restaurants. Small wooden house that made this restaurant crowded with tables bench in all directions, some visitors have been occupying a table that is a typical Indian spices and aromas greet the nose of the tourists. The atmosphere inside the restaurant still feels comfortable and enjoyable as Marken atmosphere out there. While eating lunch accompanied by the song Indian cheerful and talked a lot with a friend, maybe you already do not care about anymore is how much time is spent in the corner of the restaurant.